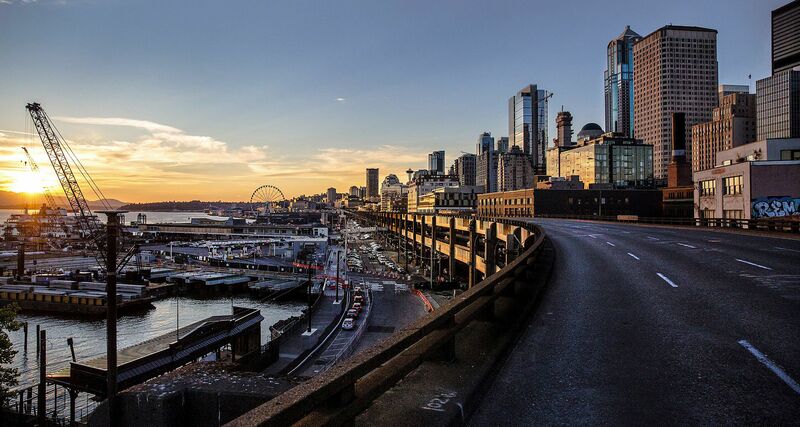 The state’s incident-response teams, lurking roadside in their white trucks, saved Seattle area commuters from regional gridlock Tuesday by rapidly clearing four Interstate 5 crashes and stalls on the second weekday since the Alaskan Way Viaduct permanently closed. Tuesday’s challenges began just after 5 a.m. northbound near Mercer Street, where a stalled car was cleared in 13 minutes.Then a stall near the south city limits at 5:37 a.m. was cleared from the center lane in 12 minutes, followed by another 6:07 a.m. stall in a center lane at Seneca Street, also moved in 12 minutes. An hour later, a noninjury crash blocked multiple lanes on southbound I-5 at Stewart Street at 7:20 a.m. The team needed 15 minutes to make it through congestion but reopened the lanes by 7:46 a.m., before the wreck could bring the freeway to a standstill. I-5 overall moved slightly faster than average from Everett into Seattle. “Clearing these incidents reduced any compounding effect to the morning commute, which was already pretty tough,” said spokesman Bart Treece of the Washington State Department of Transportation (WSDOT), who praised teamwork with the Washington State Patrol. As for the public, commuters generally followed Monday’s pattern by leaving in buses and cars earlier than normal. And by Tuesday afternoon, Mercer Street in Seattle was already jammed by 2 p.m. as people who drove in early apparently departed early, too. Highways seemed busier Tuesday, as people returned from telework or a makeshift three-day weekend. At their worst, morning delays were 30 minutes longer than normal from Federal Way into Seattle. Traffic slowdowns near Federal Way started at 4:30 a.m., a half-hour sooner than usual, according to the WSDOT traffic-control center. 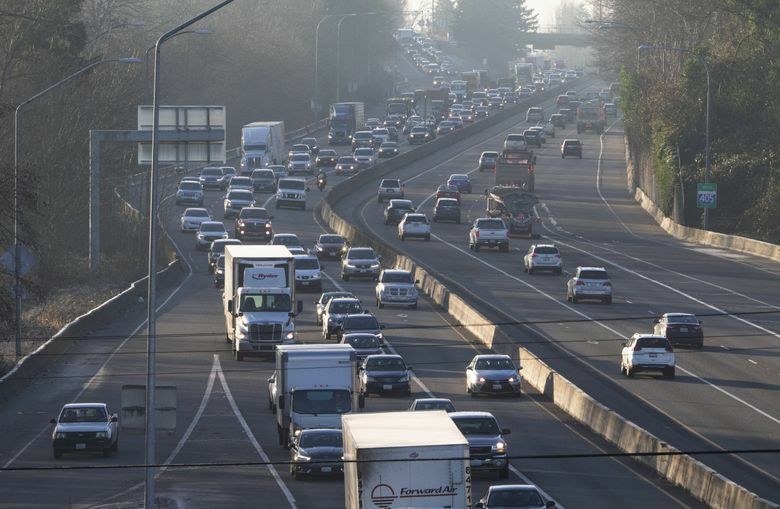 On the Eastside, northbound I-405 into Bellevue and northbound Highway 167 into Renton generally flowed 10 minutes slower than normal, as traffic diversion from Seattle spread to the east, said Mike Swires, WSDOT traffic engineer. That’s in addition to the usual slog that can average 42 minutes from Tukwila to Bellevue. Trips from Everett to Lynnwood flowed easily, but Seattle slowdowns added 10 minutes of extra delay, pushing trip times past one hour. The worst problem Tuesday struck in the North End, where a northbound truck toppled and spilled dirt near Northgate Way at 8:51 a.m. A State Patrol picture also showed a small fuel spill being sopped up by absorbent. Drivers squeaked by in the carpool lane, but responders couldn’t open a second lane until 10 a.m. Traffic stood still for five miles, back through the University District. A witness said the trucker swerved right to avoid rear-ending a vehicle ahead, then overcorrected to the left, said Trooper Rick Johnson. State incident teams in their white trucks are easily taken for granted. Washington State Department of Transportation (WSDOT) says it averages 60 clearings per weekday between Marysville and Olympia, and restores highway lanes within an average 12 to 13 minutes for noninjury crashes and stalls. 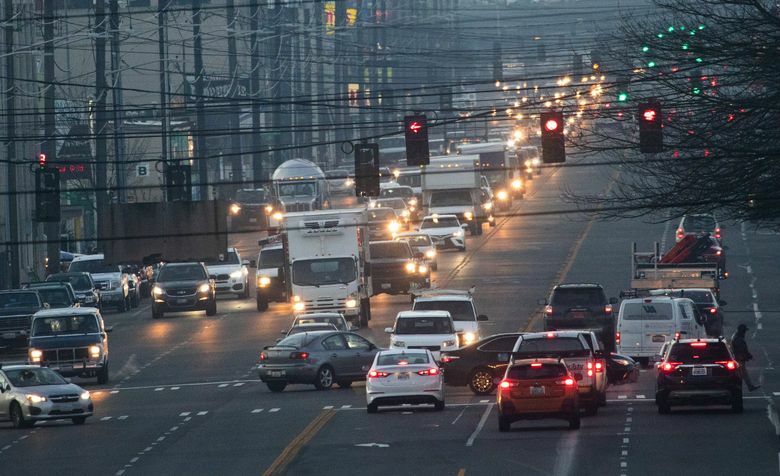 The Seattle DOT last year beefed up its own incident squad by purchasing or retrofitting five trucks, along with electronic signs and front shields for pushing cars. Tuesday’s quick responses likely prevented secondary crashes, said Treece. WSDOT is deploying as many as 27 teams over the course of a day in the Puget Sound region, some working 12-hour shifts, during this winter’s increased risk of a paralyzing stall. Light rail and West Seattle buses ran mostly full by 6:30 a.m., according to tweets by frequent riders. West Seattle water taxis carried 1,200 passengers Tuesday morning, down from 1,350 people on Monday morning, said spokesman Jeff Switzer. Plenty of room remains on the boats and in a temporary park-and-ride lot a half-mile south, he said. Buses will have the option of bypassing afternoon clogs at Pioneer Square, by going southbound in their own lane that SDOT striped on waterfront Alaskan Way. After a breakdown in its reservation app Monday evening, Metro’s contractor restarted the Ride 2 Transit service in West Seattle that provides door-to-dock van service. At the West Seattle Water Taxi, which is tripling normal passenger counts, workers have started pre-collecting fares at the downtown dock in evenings, so people can quickly board once the vessel arrives. King County and Kitsap Transit must stay on schedule as five vessels share two downtown dock slips. Parking restrictions have been extended on Airport Way South through Georgetown. Citywide, cars are being rapidly ticketed or towed in temporary no-parking areas. On Third and Pine, at one of downtown Seattle’s busiest bus transfer points, some commuters had changed their routines Tuesday to adapt to the shutdown, but few were seeing big slowdowns. Many expected things to get worse as people’s initial preparations fade, and old commuting habits creep back. Joe Huber left an hour earlier than normal to get from West Seattle to South Lake Union, taking Metro route 55 to route 40. Todd Wallen normally drives from Auburn to his job at F5 Networks in Lower Queen Anne. But he’s (mostly) ditching the car for the three weeks of the Highway 99 shutdown, driving instead to the Angle Lake park and ride, to catch light rail downtown and then Metro route 24. Heavier than normal traffic is expected over the coming three weeks, at least until the new four-lane Highway 99 tunnel opens approximately Feb. 4. The state has purchased billboard space and begun to advertise for the transition, emphasizing that the tunnel will be toll-free until sometime this summer.